Tomato week is in full swing celebrating all the deliciousness that this vegetable (that's really a fruit) brings to the table. In the last decade, we have strayed from the generic Beefsteak and Roma tomatoes and ventured onto more exotic varietals like Amish Rose, Black Krim and Garden Peach. Garden peach is a yellow tomato with a fuzzy skin (hence, the name) that I stumbled upon at the Santa Monica farmer's market. This tomato quickly surpassed many of my favorite tomato varietals and ranked in the top five - that's how good it is. It has a balanced sweetness with an underlying savory flavor that makes this particular type of tomato extremely versatile. 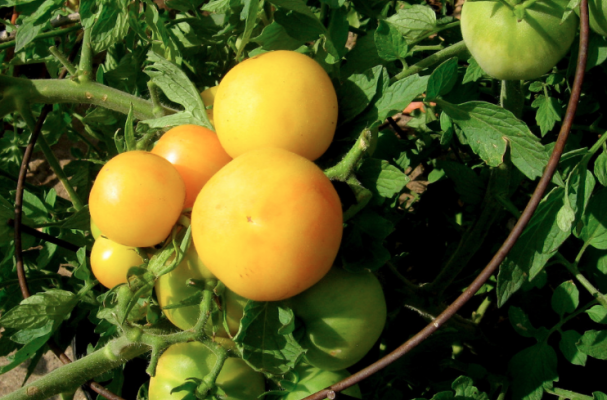 I like to pair Garden Peach tomatoes with fruit, such as in a salad or salsa. A quick and easy recipe is a peach caprese salad. To assemble, layer slices of ripe summer peach with this tomato and basil and arrange in a circle. Place a ball of burrata cheese in the middle and season the entire salad with salt and freshly ground black pepper. Right before you are ready to serve, drizzle the plate with a fruity extra virgin olive oil and balsamic vinegar. This simple but beautiful dish shines the spotlight on these two seasonal treasures.